Meerkat island aside, what part of Life of Pi earned it a nomination in this category? The look and feel of the lifeboat? The precise level of surreal air given to any particular scene surrounded by vast open sea? But the Art Directors Guild gave it the win in the fantasy film category so maybe I don’t know what I’m talking about. I specifically saw Les Miserables on a larger screen because I thought the sets would be fun to see, but they were underutilitzed in the film. Director Tom Hoopers constant closeup shots didn’t bother me as much as it did others, but it certainly made it hard to appreciate the backdrops. The film also lacked the epic air I expected it to have, part of that due to uninspired (and overly-digital) period sets. Lincoln and The Hobbit both have very effective production design that subtly help establish their settings without getting in their way. They are also both somewhat unmemorable and The Hobbit‘s sets aren’t really breaking any new ground. There are a few new castles, but otherwise much of the film takes place outside or in settings first created for Lord of the Rings over a decade ago. That leaves me with Anna Karenina. I love the creative use of sets in this film. 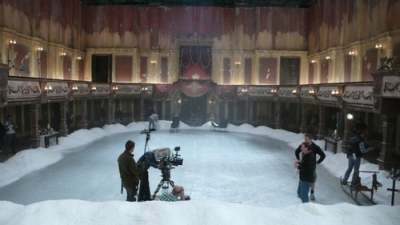 Many scenes take place in an old theater that is constantly shifting to represent different settings, from a horse race to a train station to a ballroom. The film notably loses its luster in its second half when it moves away from the theater more often. I am somewhat conflicted, however, because I’m not sure it’s much more than a gimmick. I pilloried the nomination Nine received in this category a few years back because it was basically creative use of scaffolding and I don’t want to be a hypocrite. But, hell, the production design by itself greatly enhanced my enjoyment of the film so I’ll roll with it, even if the “living life on a stage” allegory is a little trite. There were several films with really interesting production design that would have made for a stellar list of nominees. What about the various spacecraft of Prometheus? The numerous time periods – particularly the future dystopia – of Cloud Atlas? And, especially, Skyfall for its villain lair, Shanghai skyscraper, gloomy London offices, and creaky Scottish estate? I haven’t been able to bring myself to see The Hobbit, so I won’t submit a vote, but I wanted to a say a few words on behalf of Anna Karenina, my clear favorite among the other four nominees. Granted, I’m not sure the production design was used as well as it could have been (I’m putting that more on Joe Wright). But I can vividly remember the sets from the film (no small feat), a wide array of different settings. And different levels, really, thanks to the odd play within a movie effect that Wright seemed to be going for, some of the time. Those meta-sets were all extremely clever. I also thought the design team put together some pretty impressive sets which were a little more traditional. 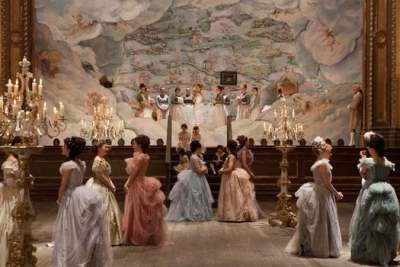 Oblonsky’s workplace and home, the cottage in the field, Vronsky’s apartment, really, just about everywhere felt heightened without going over the top, a large range of different types of sets, all of which enhanced the feel of the movie. As usual, this category is dominated by fantasy and period pieces. Lincoln, Anna Karenina, and Les Miserables all have flashy period costumes, but I’m a little tired of frilly frocks taking this prize year after year. Plus, as advocates for more contemporary designs often point out, a lot of period costumes can simply be rented. 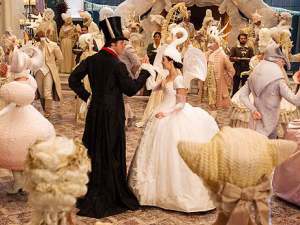 Not to deride the costumes in these films – all are notable and interesting in their films – but none feel vital to their films or their visual designs except that they are period-appropriate. The Snow White films do more. In Snow White and the Huntsman, I’d say Cherlize Theron’s Evil Queen wardrobe really drove the nomination and her clothing, in turn, helped set the tone for the character. But Mirror Mirror takes only about five minutes to win the battle of the Snow Whites and, therefore, this category. 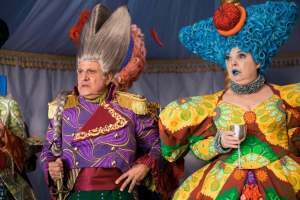 The late Eiko Ishioka designs a wide range of bizarre yet delightful designs that contribute to the film’s fun, campy tone. An animal-themed costume party and the seven dwarfs’ slinky pogo pants are two standouts for me. Looking at some other films that might have made an impact here, how about combination of period clothing and Andersonian design for Moonrise Kingdom? Or the bizarre fashion and dystopian look of The Hunger Games?